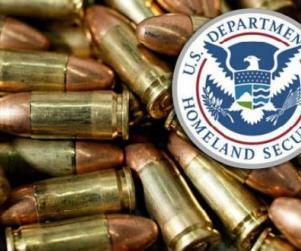 From TheHill.com, By Pete Kasperowicz – 06/05/13 – The House late Wednesday voted to stop the Department of Homeland Security (DHS) from entering into new contracts to buy millions of rounds of ammunition until the Department of Homeland Security (DHS) reports to Congress on the need for the ammo, and its cost. The Meadows language passed late Wednesday night in a 234-192 vote. The House considered dozens of amendments to the 2014 spending bill for DHS, H.R. 2217. Two others considered Wednesday night would delay the implementation of last year’s law that would phase out federal flood insurance subsidies and put the flood insurance program on a path toward market-based rates. Rep. Bill Cassidy (R-La.) proposed language prohibiting the spending of any funds on this law in 2014. Several members said the language was an attempt to reverse a bipartisan deal on flood insurance passed last year, but many other members in flood-prone states supported it, and the House approved it in a 281-146 vote. Rep. Jon Runyan (R-N.J.) proposed similar language that would delay increases in flood insurance premiums in New Jersey and New York, but the House rejected that proposal in a 148-278 vote. — Tim Bishop (D-N.Y.), canceling the National Bio- and Agro-defense Facility in Kansas and moving $404 million to the spending reduction account. Failed 80-345. — Jim Moran (D-Va.), prohibiting the use of funds for the transfer or release of Khalid Sheikh Mohammed or other Guantánamo Bay detainees housed there after Dec. 31, 2005, not those held on or after June 24, 2009. The date change is an attempt to clarify that detainees held before late 2005 may be released, not the 9/11 suspects who were shipped there starting in 2006. Failed 165-261. — Scott Garrett (R-N.J.), prohibiting the use of funds for random Transportation Security Administration (TSA) inspections conducted outside airports. Failed 180-247. — Tim Ryan (D-Ohio), prohibiting the use of funds to pay DHS salaries of officials who approve immigration decisions for relatives of Brazil. This was an attempt to partially reverse an earlier decision by the House to strike language blocking immigration from Brazil due to the country’s failure to extradite a woman who killed her husband, who was a U.S. Air Force Major. Failed 50-373. — Alan Grayson (D-Fla.) en bloc amendments: prohibiting spending to enter into contracts with companies convicted of crimes or charged in a civil case, or has a delinquent tax bill of more than $3,000; prohibiting spending that violates the First, Second or Fourth Amendments to the Constitution; prohibiting spending to buy armed unmanned aerial vehicles. Passed in voice vote. — Patrick Murphy (D-Fla.), prohibiting the use of funds for the Agricultural Quarantine Inspection Program. Rejected in voice vote. — Doug Collins (R-Ga.), prohibits the use of funds to process the release of detainees who committed a crime. Passed in voice vote. — Bennie Thompson (D-Miss. ), prohibiting the use of funds for TSA’s behavioral detection program. Failed 147-279. — Matt Salmon (R-Ariz.), prohibiting the use of funds in cities that are sanctuary cities for illegal immigrants. Passed in voice vote. — Sheila Jackson Lee (D-Texas), reaffirming that DHS has discretion to use federal air marshals on high-risk flights. Passed in voice vote. — Phil Gingrey (R-Ga.), prohibiting spending to weaken the 287(g) program allowing state and local officials to enforce aspects of immigration law. Passed in voice vote.